I hope everyone had a fabulous weekend! Is everyone excited for Halloween? As for me, I am terrified of anything that is scary but managed to spend my weekend screaming and running away from monsters at Universal Studios Horror Nights. How was your weekend? Prior to my wonderful journey down the "Walking Dead" road, I spent my Sunday hanging out and shooting with one of my closest friends. We chose to spend our day in Old Town, Pasadena and she always manages to snap great photos. I am wearing a black jacquard skirt that I paired with my favorite chambray top. I added leopard contrast heels and a red lip to add a pop of print and color. It's starting to get chilly in L.A and I couldn't be any more excited to start wearing sweaters with boots. I spent my lovely Sunday afternoon in Downtown L.A and was in a "black and white" dress code mood. I paired this amazing white pleather skirt with a cropped sweater pairing it with black ankle boots and accessories. As it starts to get colder, you will start seeing me more in sweaters paired with skirts because currently that's all I seem to be gravitating towards. Of course, we can't forget my plaids and leather too! Hope you all are having a great week! Don't forget to join me and my fellow L.A blogger fashionistas this Thursday, October 17th for my Beverly Center Style Challenge! Tartan prints, leather, big statement jewelry, lace-ups.. they are everywhere! Inspired by my last outfit post, I decided to create a collage of my favorite items that I am currently lusting over that reflects the whole grungy chic look. It's a bit more edgy but still with feminine elements of lace up details and big bold jewelry. With leather being such a strong statement this season, I have recently been pairing it mostly with black and white graphic tees and throwing on an easy casual flannel to add some more color. How are you feeling about the grungy chic look? I loves it. I hope everyone had a fabulous weekend. Mine was filled with concerts, Disneyland, and some major shopping damage for a fashion challenge! I have been chosen to participate in a wonderful fashion opportunity among other L.A blogger fashionistas. 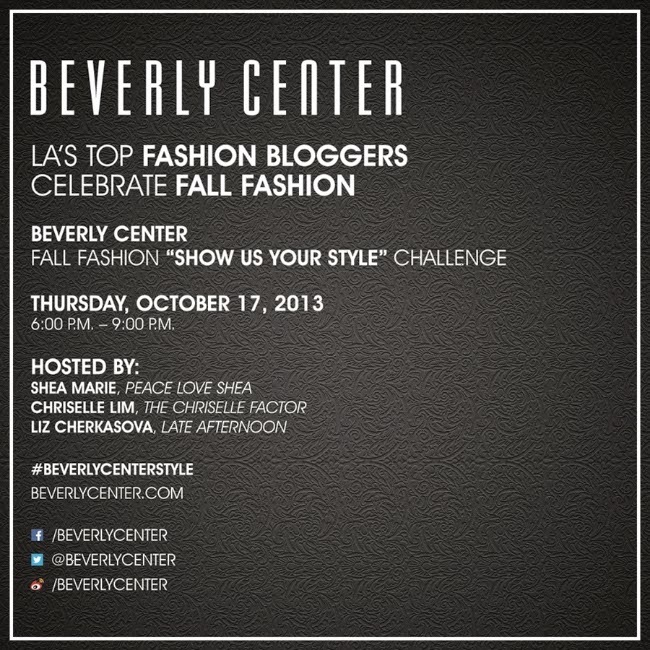 It is hosted by the Beverly Center and we were lucky enough to be given $125 to shop for a "Fall look". Might I add, shopping under a budget is quite a challenge! We were only allowed to use two items from our closet and I knew I had to stay authentic to my own style, which is why leather were my chosen personal pieces. Grunge. Edgy. Chic. These are three of trends emerging everywhere this fall season and couldn't be any more perfect since it very much reflects my own personal style. For me, Fall is filled with jeans, leather, flannels and dark bold colors. Layering is not only casual but also chic! I paired this amazing campfire plaid flannel with silver accents of jewelry along with leather. Currently obsessing over boots, I paired it with some over the knee boots to add some edginess to my casual outfit. Lipstick has been my best friend for a while now and I think this outfit needed a pop of matte red on the lips, which is what I finished the look with. This wasn't only a challenge but also a competition! While I enter to win the grand prize, you can also enter to win a prize by voting for my look HERE. What are some of your favorite Fall trends? Make sure to join me and my fellow fashionistas on Oct. 17th to see who takes home the ultimate grand prize of the "perfect Fall look" ! Stay tuned!